The Brazilian Bombshell” was born on February 9th, 1909. 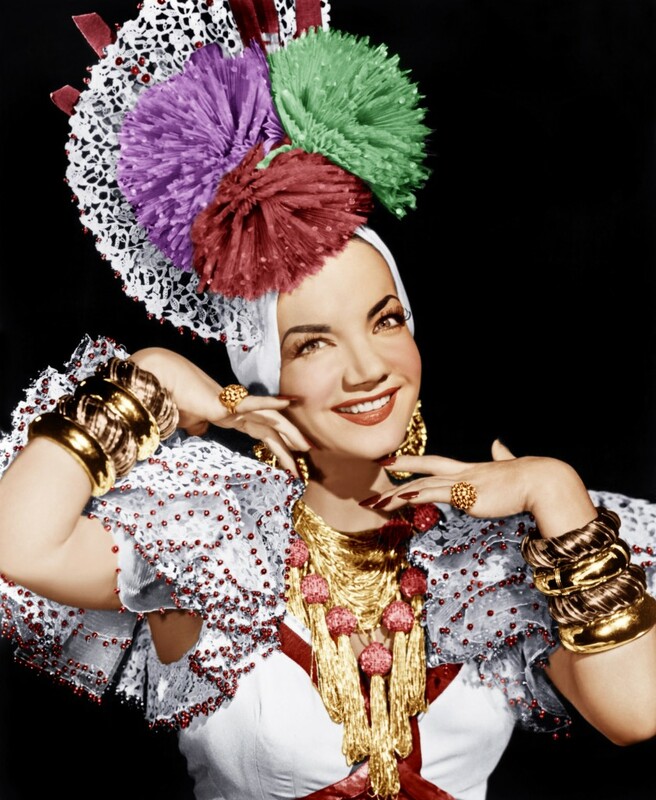 At the peak of her career, Brazilian singer Carmen Miranda (1909–1955) was the highest paid woman in Hollywood. Known for her colorful outfits and fruit-bedecked headgear, Miranda was one of the first ambassadors of Latin American popular culture. She appeared in more than a dozen movies, often along-side the era’s top stars, but was usually typecast as the exotic songstress in the plots. “Many of her compatriots never forgave her for the pastiche of mischief and malaprops that became not only Miranda’s trademark Hollywood act but also synonymous with Latin America itself,” Mac Margolis wrote in Newsweek International. Miranda was born in Portugal in February of 1909, and christened Maria do Carmo Miranda da Cunha. Her parents, Jose and Maria, left the town of Marco de Canaveses, near Oporto, when she was still an infant; they settled in Brazil, home to many Portuguese immigrants. They lived in central Rio de Janeiro and her father worked as a salesperson and a barber. The nick-name “Carmen” dated to Miranda’s childhood, when her family reportedly dubbed her that after the Georges Bizet opera by that name. Miranda arrived in New York in 1939 to perform one song in The Streets of Paris, a musical review at the Broadhurst Theater that ran from June of 1939 until the following February. She sang it in Portuguese, and spoke very little English when she came to New York, but she was game enough to give an interview to promote the show. Her limited vocabulary became a long-running joke in that and subsequent stories in the press about her. She enthusiastically repeated a few words, including “yes,” “no,” “money,” and “hot dog.” Though her treatment in the press seemed to reinforce stereotypes about Latin Americans, Miranda’s Streets of Parisnumber was a hit with audiences, and led to an engagement at the Waldorf-Astoria hotel. She also made her first film for a Hollywood studio, the musical romance Down Argentine Way, starring Don Ameche and Betty Grable. Miranda was cast as herself in the 1940 release, which was one of the first musicals filmed entirely on location, in both Buenos Aires and New York, due to her still appearing nightly in The Streets of Paris.